1 of 9 Stir together 4 tablespoons of the superfine sugar, the cocoa powder, gelatin, flour, espresso powder and salt in medium-size saucepan. 2 of 9 Whisk together milk, egg yolk and chocolate syrup in a small bowl. Stir milk mixture into the cocoa powder mixture in saucepan. Cook, stirring, over medium-low heat until mixture is thick enough to coat back of a spoon, 12 to 13 minutes. 3 of 9 Remove the saucepan from the heat. Stir the vanilla into the chocolate mixture. Then scrape the chocolate mixture into a medium-size bowl. Place the bowl in a larger bowl of ice water, being careful no water splashes into the chocolate mixture. Cool, stirring the chocolate mixture occasionally, until it is the consistency of pudding, for about 20 minutes. 4 of 9 Heat oven to 350 degrees F.
5 of 9 Coat eight 1-1/4-cup ramekins with nonstick vegetable-oil cooking spray. Sprinkle inside of each ramekin with 1/4 teaspoon superfine sugar, for total of 2 teaspoons. Turn the ramekins to make sure the insides are evenly coated. Or coat a 2-1/2-quart souffle dish with nonstick vegetable-oil cooking spray and coat the inside with the 2 teaspoons sugar. 6 of 9 Beat together the egg whites and cream of tartar in a large clean bowl with clean beaters until soft peaks form. Gradually add the remaining 2 tablespoons of superfine sugar, beating until stiff, but glossy peaks form when the turned-off beaters are lifted. Fold a quarter of the egg white mixture into the cooled chocolate mixture to lighten. Fold in the remaining egg white mixture until no streaks of white remain. 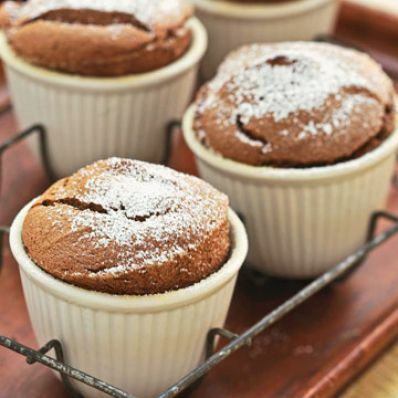 Divide the souffle mixture among the individual ramekins or spoon into the large souffle dish. 7 of 9 Bake the individual souffles in 350 degrees F oven for 25 minutes or until puffed and slightly browned; or bake the large souffle in 350 degrees F oven for 45 minutes. 8 of 9 While the souffles are baking, puree the raspberries with their syrup in food processor or blender. Push through a fine-mesh sieve to remove the seeds. 9 of 9 Once souffles are done, lightly dust tops with the confectioners sugar. Serve immediately with the raspberry sauce.